Prof. Anil Kumar Indira Krishna is Country Technical Lead, Non-communicable Diseases, Help Age International, Myanmar and Professor in Global Health and Population. Prof. He had served as Professor, Dean and Associate Dean School of Public Health, SRM University, Chennai, India from 2009-2018. Anil has also served as Principal Investigator of over 15 public health projects funded by national and international organizations. Prior to that Anil has worked with several international, national and UN organizations in India and Bangladesh in implementing research and programs in public health. He has been coordinated large scale research studies such as Multiple Indicator Cluster Survey, Global Adult Tobacco Survey, Demographic Health Survey and India Population Project. His research focuses on health systems, implementation science research and translational research. 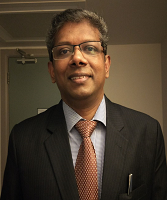 Anil holds the doctorate in public health and has been working in the public health over two decades. Currently, Anil is leading a team of academicians and policymakers in evidence-based policy initiative for the European Union supported project “Strengthening Health System’s Capacity to Respond to Disease Transition in Myanmar”.